Craftspeople make incredible things out of the most random stuff, though apparently not enough of them to keep that magazine in business. For a guy getting crazy with cans, check out Can Do Planes. 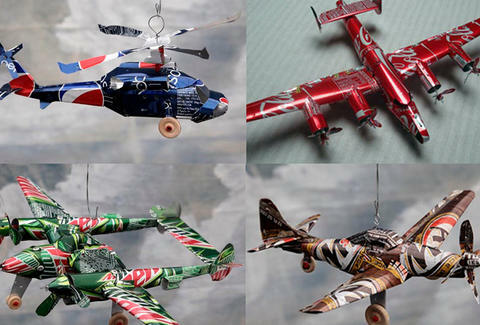 Aircraft: Planes come in small, medium, and large sizes (up to 14in), including spent-beer replicas of a WWII Spitfire, B-17s, and helicopters, plus a Coca-Cola version of an F-16 Fighting Falcon, which strangely looks quite a bit different than Quinn Ojinnaka's Facebook pics. Vehicles: Ground transpo includes a gang of rides (tank, motorcycle), a Coked-out dump truck, pirate ship, and Jeep, and even a Pepsi edition of the very first Dodge automobile, since you can't exactly take a Journey back in time. Animals: Go Dr. Pepper with a small horse, dinosaur, or dolphin, or nab a crane or deer made from Sun Drop, a drink originally almost-popularized by Michael Jackson, but don't worry, he was just kidding. Just email or call the creator to get your piece ordered, either picking a specific beer or soda, or providing your own cans to make the model you like, although the ones you used to see in Stuff are gone forever. Unless you're some fancyboy with the Internet.